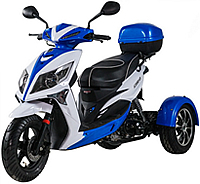 NEW ARRIVAL ~ ICE BEAR 50cc "BULLSEYE" Motor Trike /3-Wheeler has the Unique and Sleek body design, Big bright eyes and lighting system, Automatic transmission. Differential driving device. 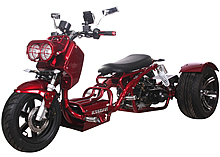 Chain driven, Dual disc brakes, Backup kick start, Trailer hitch, Matching rear trunk, Aluminum rims, and many more great features.. 100% Street Legal and a motorcycle license is not required to operate this trike in most States! 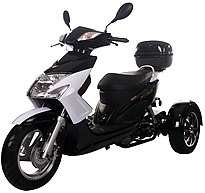 ICE BEAR 50cc "Mini Cruzzer" Motor Trike /3-Wheeler. 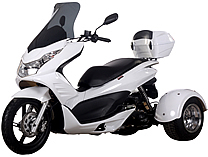 It has the Sleek body shape, Lots of storage room, Bright lighting system, Detachable extra large front carrier and rear trunk with backrest. Full Automatic transmission. Differential driving device. Chain driven, Dual disc brakes, Backup kick start, Trailer hitch, Matching rear trunk, Aluminum rims, and many more great features.. 100% Street Legal! 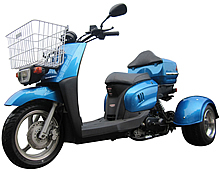 ICE BEAR 50cc "ELF" Motor Trike /3-Wheeler PST50-16. It has a very sleek and unique body shape, Lots of storage room, Bright lighting system, Detachable large matchingrear trunk. Full Automatic transmission. Differential driving device. 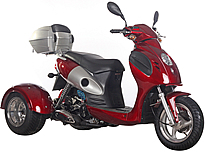 Belt/Chain driven, Dual disc brakes, Backup kick start, Trailer hitch, Polished aluminum rims, 12" big tires, and many more great features.. 100% Street Legal!